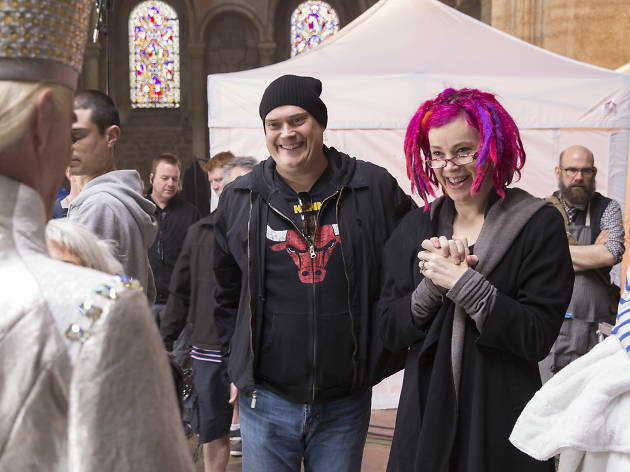 With their new film Jupiter Ascending, sibling writer-directors Lana and Andy Wachowski have pulled off something increasingly unusual in modern filmmaking: a big-budget sci-fi adventure that isn’t adapted from a comic book or TV show but springs directly from their own out-there imaginations. Bursting on to the blockbuster scene in 1999 with their second film, The Matrix, the Wachowskis have consistently proved to be daring, subversive voices in mainstream cinema. And while films like V for Vendetta (which they wrote and produced), Speed Racer and Cloud Atlas may not have followed the early success of their Matrix trilogy, their movies could never be mistaken for the work of anyone else. Andy You’re asking, what’s our character arc? Lana There are ideas that have resonated through our work since the beginning – the nature of identity, and the struggle against institutional oppression. Those things will always be a part of us. We’re natural outsiders. I’m an out trans person with pink hair! But we’re more courageous as storytellers now. We’re better and braver and we take bigger chances. We don’t want to tell simple stories about good guys and bad guys. We try to make movies that are unique and complex. Jupiter Ascending harks back to The Matrix, the story of an ordinary person who turns out to have extraordinary powers. What appeals to you about messiah stories? Lana Well, we all wanna be the messiah, don’t we? We’ve always been interested in identity and its relationship to society. What’s your place in the world? What do you have to offer? Those are ideas that we all confront and wrestle with in our lives. And when you add spaceships and kung fu, it naturally spirals towards a grander scale. Andy I don’t necessarily agree that we’re just about messianic characters. In The Matrix, all the characters claim their own destiny. Everyone participates in the saving of the human race. The message is that we are all god, we all have responsibility for the outcome of our lives, our destinies and our fate. Lana There’s a joy in creating a new world. It goes back to our childhoods when we used to love role-playing games. It was all about creating a new world we could play in. But there’s drudgery around it too. Oh god, now we have to invent a new way to represent traffic! Or buttons! Andy To tell the truth, that idea of directors as gods is something we find deplorable. We don’t claim ownership over the worlds we build. This myth of auteur directors with massive egos is a slap in the face for everybody who works on a film. We give ownership to everyone who works with us. Lana We went through all of the typical things that people describe when they’re trying to understand how they got in the unbelievably lucky position of getting paid to make things up. You have parents who are supportive, you love reading and writing, you work constantly and you get lucky. For anyone who gets to make a living making art, it’s the greatest gig in the world. It’s like a rainbow has come down on your head. But we worked hard. We labored long into the night trying to get better and better. Is your sibling bond an important part of it? There seem to be a lot of filmmakers in a similar position—the Coens, the Dardennes. You don’t get that with firemen or doctors. Andy It’s a hard job. If you have a partner that you can trust implicitly, that helps. For directors, it can be incredibly lonely. Unless they’re super-well-adjusted, the prospect can be frightening. Andy We call mom. She sorts it out for us. Lana If there’s discord around a creative point it usually means there’s a better solution we haven’t thought of yet. When we both feel good about it we know it’s perfect. In your last few films you’ve worked a lot with make-up. How does an actor like Channing Tatum, who plays a genetic hybrid wolf-man in Jupiter Ascending, deal with all those hours in the chair? Lana When we show the actors our ideas they get excited. It has a circus, dress-up feel to it. But it can be tough. Channing’s hair was a big issue. We wanted to create a texture that was like fur but didn’t end up looking like Teen Wolf! We finally combined one kind of greasepaint with product to make a really fur-like texture. It destroyed his scalp but he was a trooper about it! Lana We wanted Mila Kunis’s character, Jupiter, to be the most complex in the movie. We didn’t want another action movie where the woman ends up being just an armpiece for the man. We wanted to make the man into her armpiece! The Wizard of Oz was a big reference. I thought, How great it is that Dorothy has Toto, he’s always at her side, defending her? We wanted Jupiter to have a protector like Toto. Lana That’s a can of worms! As a society we don’t value originality as much as we once did. We hype and we champion derivative material. I have a theory that if you look at the great original sci-fi movies—Alien, The Terminator, Star Wars—they were all made before 9/11. So I think it’s about our relationship to certainty. We’re drawn to certainty, to books and comic books, to things we know. With Jupiter Ascending, we wanted to make something that was original, and that wasn’t cynical. A fairytale romance. Again, if you look at Star Wars, there was something so joyful about it. We wanted to find out if we could still make a movie like that today. Jupiter Ascending opens in theaters Fri Feb 6.